So Who’s your Daddy? The story of Reggie Dabbs, a man born to a teenage girl, conceived by an unknown father. His story is one of salvation and ministry to today’s youth. This is the story of Reggie Dabbs. The story of his journey to find his identity and value as a person. The story of how that journey evolved into his outreach to the fatherless children of the world who face the same identity crisis. Reggie shares how his broken beginnings lead to salvation and a changed future. There is a story early in the book about a poem Reggie wrote for one of his high school classes. Never a serious student, his initial poem might sound familiar. The poem didn’t fare so with his teacher and he was given a second chance. This time he came up with the following. This is the story of so many young people today. I’ve worked with them through a program called Royal Family Kids Camp and Teen Reach Adventure Camp. Both are ministries to abused and neglected foster kids. Kids just like Reggie. My wife and I have also spent time with a ministry to incarcerated teen girls. In almost every case, these kids come from a broken background. If you desire to understand, or even better, work with kids from broken families, I would highly recommend you read this book. Much of what Reggie shares regarding his life, and those of the kids he talks to, parallel the attitudes and thoughts of the foster kids I’ve worked with. Here are a few of the messages that resonated with me. That God is both Father and Daddy, both powerful creator and gentle caretaker. 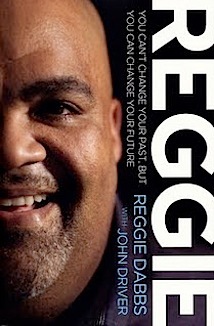 Reggie’s belief that God’s love, shown through a caring person, can penetrate and bring hope to the most hardened heart. The story of Hosea and his wife Gomer. An incredible story of God’s love for persistence in reaching the broken. Life is a journey of discovery. Our past doesn’t have to control our future. That each of us has a God given passion. It should be our goal to discover it and pursue it. The book itself bounces around a lot. I wish in hindsight I had read the first few chapters and then jumped to the last chapter titled Big Daddy; Know Your Father. This would have made the middle of the book much more clear. As it is, the book at times seems like a series of topics that Reggie might share while speaking. In fact, at times I struggled to find continuity. It will help If you go into the book knowing this. I think that many of the chapters stand on their own. I think you could easily move around chapters once you read the first few. Reggie was raised by a loving foster dad. He speaks fondly of the love and lessons that were given to him. He uses this to distinguish between his biological “father” and the father that raised him, the one he calls “Daddy.” Reggie summarizes his work and ministry in a short passage near the end of the book. I find this relevant and credible because it is the same message and ministry of Royal Family Kids Camp and Teen Reach Adventure Camp. The message is true, I have seen it change the lives of broken kids. It is a message worth pursuing. “I have a biological father, but he definitely was not my daddy. My daddy was the man who chose me, brought me into his home, even if he didn’t bring me into the world. My face my resemble my father’s, but my life resembles my daddy’s. I talk as he does. I think as he does. I act as he does. Most of the world knows God as a biological father but not as daddy. Abandoned children often resent the characteristics they share with their biological parents, as if those characteristics are nothing more than cruel reminders that they were not loved enough to be kept. Thus, a world resents the standards and morals it inherited from creation’s Father, mostly because they have no idea that God is more than a father; he’s a daddy. Maybe your life has been broken along the way. Or like me, you desire to work with kid who’s have. If so, I highly recommend this book. It’s true that you can’t change your past, but after reading this book, you just may change your future. Thanks for sharing Ted, I may have to pick up a copy.